College: McKienzie played at Long Beach State, where he set the NCAA Division I record for most kills in a match (58 at BYU on 3/19/99). Twice he was a First-Team AVCA All-American in addition to being a Second-Team selection his sophomore season, when the 49ers were the National Runners-up. Indoor: Following college McKienzie joined the USA National Team, winning a gold medal in the 2001 World University Games in Beijing, which was the first for the USA men in that competition. He was one of six alternates for the 2004 Olympic team. From 2008-2011 McKienzie played overseas as well as some beach and then rejoined the USA National Team and competed in the 2012 Olympics in London. Personal: McKienzie comes from a volleyball-rich family. His father, William, played for the U.S. at the Pan American Games. His older sister Joy was an All-American setter at Long Beach State, where she won a National Championship in 1993. 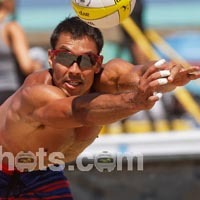 His brother-in-law is former AVP player Matt Fuerbringer (married to Joy). McKienze grew up in Denver but moved to California during his sophomore year in high school to live with his sister Joy.